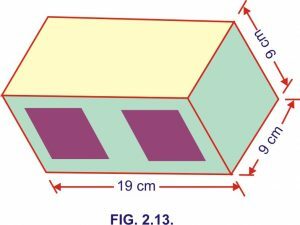 Below are described a few important forms in which bricks are made in various shapes to suit the different situations in which they are used. 1. Ordinary bricks. 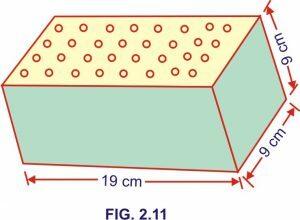 These are ordinary bricks with rectangular faces and of standard size. Advantages. (a) These dry and burn more easily and quicker as the hot gases can penetrate them. (b) Because of reduced weight these are easier to handle. (c) Because of saving in clay more bricks can be cast out of the same quantity of earth. (c) These are unfit to be used in hydraulic structures. These bricks should be free from cracks, flaws and nodules of free lime. Their faces should be plane, uniform, rectangular, of uniform colour and texture. The dimensions are 19×09×9 cm and 29×9×9 cm. 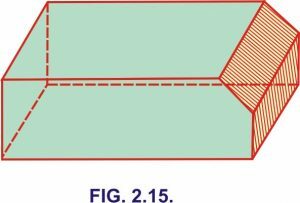 Perforation area should not exceed 30 to 45% of the area of face. For details refer to IS : 2222-1979. (a) These are only about one-third of the weight of the same size of ordinary bricks. (b) These can be laid almost four times as fast as the ordinary bricks. (c) These provide the advantages of hollow walls e.g. insulation against heat and sound. (d) These are sufficiently strong for all purposes except for concentrated loads. These are ideally suited for the construction of non-load bearing (partition) walls. 4. Splay, Cant or Plinth bricks. These have a bevel taken off on one side as shown in Figs. 2.14. and 2.15. These are used in door and window jambs and in plinths. The splay should be on the header or on the stretcher as shown. 5. 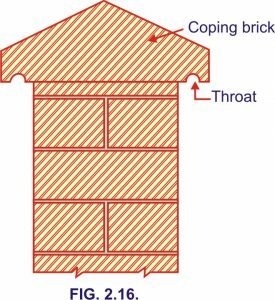 Coping bricks. These are of different shapes and sizes to suit various conditions of use. These are used as topmost course on parapets and their shapes are so made as to expeditiously drain off rain water from the top of parapets. When projecting the undersides of the projecting portions are provided with throats so as to throw the rain water off the faces of walls. One such type is shown in Fig. 2.16. 6. 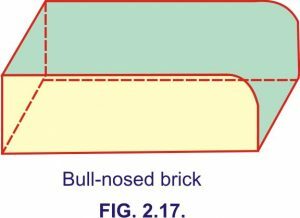 Bull-nosed bricks. These are used to round off sharp corners (Fig. 2.17.). 7. Paving bricks. Clay used for their manufacture contains more iron than the brick-earth used to manufacture ordinary bricks. Excessive iron causes the vitrification of bricks while burning. It gives them natural glaze as a result of which they can resist abrasion better. These bricks are mechanically shaped and not hand moulded. Their compressive strength is not to be less than 400 kg/cm2 and dimensions are 19.5×9.5×9 cm and 19.5×9.5×4 cm. these should not absorb water more than 5% of their weight on 24 hours of immersion in water. For details refer to IS : 3583-1975. 8. 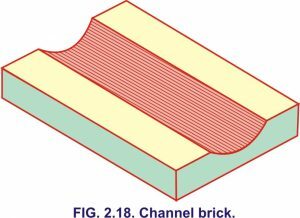 Gutter or channel bricks. These are moulded to the shape shown in Fig. 2.18. Very often these are glazed and are used for laying drains. 9. Burnt clay sewer bricks. These are bricks used in construction of sewers for domestic sewage. These bricks should be free from cracks, flaws and nodules of lime. These should have rectangular faces with sharp edges and corners. Their sizes are 19×9×9 cm and 19×9×4 cm. Their average compressive strength is not less than 175 kg/cm2 and these should not absorb more than 10% of their weight of water. For details refer to IS. 4885-1968. 10. Queen closer. 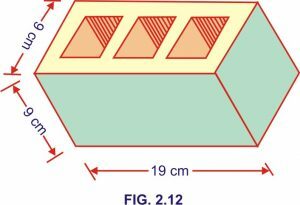 It is a brick cut into two parts longitudinally as shown in Fig. 2.19. It is placed next to the first header at the corner of a wall to get proper bond. 11. 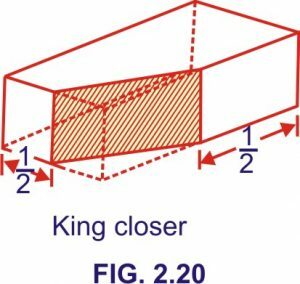 King closer. 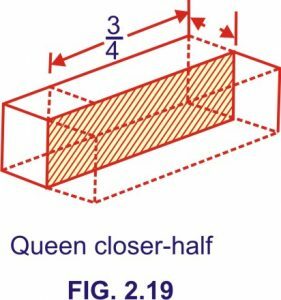 One corner of a brick is so cut as to remove half the header and half the stretcher (Fig. 2.20). It is used when two walls meet at an angle. 12. Cornice bricks. 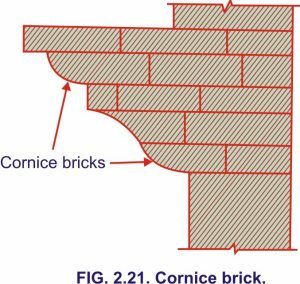 Several shapes and sizes of bricks when combined to form cornice are known as cornice bricks as shown in Fig. 2.21. 13. Arch bricks or Voussoirs. Bricks to be used in arches are moulded to the exact wedge-like shape required. Such bricks are known as arch bricks or voussoirs. 14. Circle bricks. These are bricks made to the exact curve of the desired circle and are used in the construction of circular walls for circular towers and wells etc. While ordering such bricks the radius should always be specified. 15. Purpose-made bricks. These are bricks of special shape and size made to suit a particular requirement. These are generally more costly than the ordinary bricks but ensure quicker and cleaner construction as no cutting to shape is involved. Also as the surface skin of the brick is left intact so it can withstand weather far better than those bricks that have been cut to the shape required.